Students at Strong and Phillips schools perform at the school board meeting. PHILLIPS - MSAD 58 is considering joining a new regional service center with nine other districts in a bid to recoup some lost funding. Entry into that newly-formed organization would be dependent upon Maine Department of Education commissioner approval as well as a vote at the district-wide budget meeting. Superintendent Susan Pratt presented the school board with an agreement that would apply to form the Western Maine Regional Service Center with nine other districts. The service center would take on many of the roles of the Western Maine Education Collaborative, an ongoing effort between a number of regional districts that includes more than 50 schools and 14,000 students. In doing so, Pratt said, the new service center would allow MSAD 58 to recoup state funding for system administration expenses that has been dwindling over the past two years. The regional service center model was rolled out by the previous MDOE administration as a way of allowing districts to share services and improve efficiency in areas such as technical assistance, professional development and implementing grants. Districts that did not join a service center would not be able to recoup reductions in state funding for system administration costs: funding was reduced to $94 per student in 2017-18, then $47 in the current fiscal year, and $0 in 2019-20. The possibility of declining state funding for system administration led a number of local districts to consider creating a regional service center a couple of years ago. However, superintendents and school boards were skeptical due to their inability to leave regional service centers once they were created and the idea was largely discarded. Ironically, MSAD 58 and other nearby districts had been working regionally for more than a decade prior to the implementation of the service center model. Western Maine Education Collaborative is a non-profit that consists of 15 districts that work together to plan professional development opportunities - such as the recent Rendezvous event that drew 1,400-plus educators - bulk order some supplies and collectively purchase services such as Virtual High School. The goal of the organization is to improve student performance and save money. Each district pays $4 per student to be a part of WMEC; those funds cover organizational costs and pay an executive director. "It really is a regional service center," Pratt said of WMEC. The proposal before the MSAD 58 board would create the Western Maine Regional Service Center. It would take over many of the roles of WMEC, as well as $3 out of every $4 previously sent to the collaborative. Other proposed members include RSU 9, 10, 44, 56, 58, 73, 74 and the Lisbon and Fayette school departments. WMEC would continue to exist, funded by the remaining $1 out $4-per-student payment, in order to allow another five districts that are currently members of other service centers to participate with the larger group. The service center would have no impact on this year's incoming budget. In 2020-21, however, it would allow MSAD 58 to recoup $33,000 in system administration funding, rather than losing additional funding. Another benefit would be having the state take over the funding of Power School, MSAD 58's student information system, for a savings of roughly $6,900. Unlike previous iterations, districts could choose not to purchase services, allowing them to leave the regional service center if something changed. Additionally, Pratt noted, the service center would dissolve if the system administration funding disincentive was ever removed. The school board voted to table a decision on the service center proposal until next week's meeting, to allow them to read over the document. Pratt said that while the board would apply to create the service center with MDOE, the actual decision would be made by voters at the district-wide budget meeting later this year. MDOE commissioner approval is also necessary. The board spent most of the evening talking about the budget, voting to add a math coach position at Strong Elementary. As that decision will remove a teaching position, there is no direct cost increase. The board does anticipate that a multi-grade class will be created at Strong next year, and decided to increase the district's contingency from $25,000 to $35,000 in order to be able to cover the cost of an ed tech if one became necessary to help teach that class. The board also voted to add an elementary guidance position at the cost of roughly $65,000, as well as $10,000 to add a couple days of clerical support that is necessary to keep up with demand. Currently in the draft budget are two new coaching positions for a cross-country program and a golf program. A donation through the Sugarloaf Junior Golf Program would allow MSAD 58 students to practice at the Sugarloaf course at no cost. With the proposed increases, the draft budget would be roughly $9.76 million. However, additional changes are possible and the directors will not be setting an actual, board-recommended budget until their April 18 meeting. 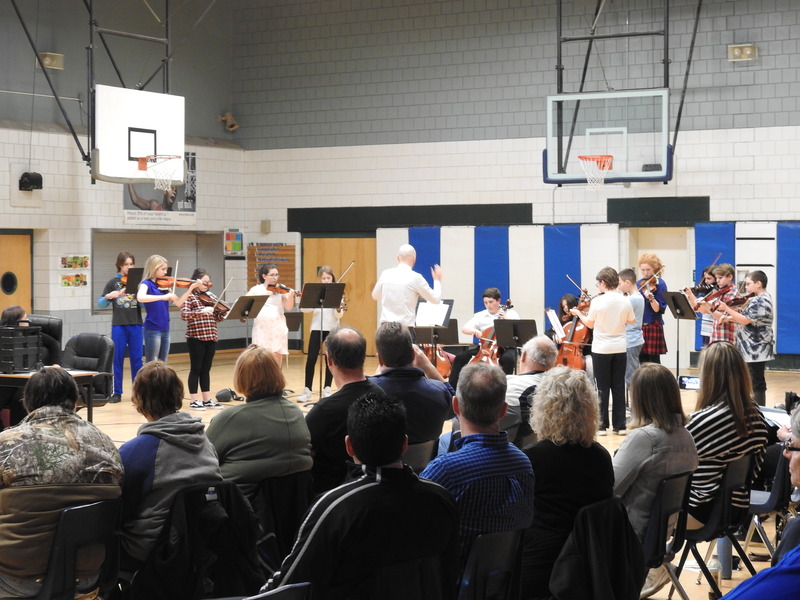 Prior to tackling business items, the board heard performances from Strong and Phillips strings and chorus students, who played or sang Fiddlers on Fire and Wagon Wheel, respectively. All for joining forces to reduce system administration expenses. No word from Superintendent Pratt on reducing the Superintendent's position to part time? Or sharing a Superintendent with another smaller district? Is this also an option to have a "service center executive?" This would make sense in a district with shrinking enrollment such as MSAD 58. It seems that many folks complain as loud as possible when the tax bills are due but where are they now? The school budget is the driving force behind many tax increases for small Franklin county communities and an open dialogue of how we as citizens can work to improve education while reducing cost is important to all. Please speak up and make your voice heard!